Note: An advanced reader copy (ARC) was provided by Macmillan-Tor/Forge via InkSlinger PR. Whenever word gets out that Katie McGarry has an upcoming release, adding it to my list of most anticipated reads becomes a no-brainer. Her latest young adult novel, Only a Breath Apart, was on that very list when I learned of its publication details, and as always, McGarry blew me away with this story of two childhood best friends who had grown apart only to find their way back to one another when they needed the other the most. While some have put this book under the YA category, because there are certain sensitive matters that it tackles--i.e. physical abuse, so please consider this a trigger warning as well--throughout, I think it's better suited with a mature YA tag. From the time he was six years old, Jesse Lachlin has had the family curse constantly in the back of his mind. It's a curse that befalls any Lachlin who happens to leave the family-owned land and punishes them in the worst way possible--by taking away those they love most from them. Other than his grandmother and mother, no one means more to Jesse than his best friend Scarlett Copeland, but all it takes is a life-altering incident over one summer for Jesse to walk away from their friendship. Three years later, Jesse and Scarlett are seniors in high school, and fate seems to be bringing them together. But in order for them to reconnect, they'll have to learn the ways of redemption and absolution, and for them to stay together, they'll have to stare down and defeat their worst fears. 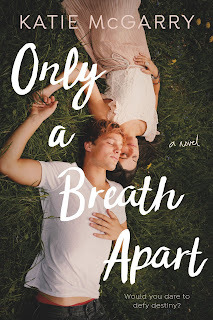 Purchase Only a Breath Apart on Amazon | Apple Books | B&N | Kobo.